Today Canon announced two new cameras designed for filming in (the new standard?) 4K resolution. The Canon EOS-1D C will be built using the same housing and specs of the EOS-1D X, but now supports filming in 4K (4096x2160) resolution. For 4K filming, a pixel-for-pixel APS-H crop will be used with 4:2:2 colour sampling and output in 8-bit MPEG compressed 24p. Full HD (1920x1080) filming is supported up to 60p (!). 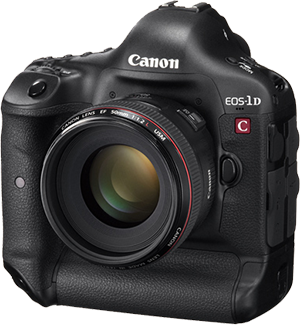 The Canon EOS-1D C can be used with all current Canon EF mount lenses. The also newly announced Canon EOS C500 is an upgrade to Canon's current top of the line C300 video camera. The EOS C500 supports 4K video and will be available both with a PL and an EF mount, allowing you to choose which type of lenses to uses on it. On top of these two new 4K video cameras, Canon also announced they will be developing some new lenses designed specifically with filming in mind: The CN-E 15.5-47mm T2.8 L S(P) (EF/PL-mount), and the CN-E 30-105mm T2.8 L S(P) (EF/PL-mount). Prices for these cameras will be pretty high; the EOS-1D C is announced to be around $15,000 when it becomes available (planned: October of this year).